Drepung Monastery is one of the «great three» Gelukpa university monasteries of Tibet. The other two are Ganden and Sera.Drepung is the largest of all Tibetan monasteries, and indeed at its peak was the largest monastery of any religion in the world. It was founded in 1416 by Jamyang Chojey, a direct disciple of Je Tsongkhapa, the founder of the Gelukpa school. It is located on the Gambo Utse mountain, 5 kilometers from the western suburb of Lhasa. 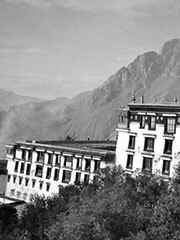 At its largest, before the invasion of Tibet in 1959, the monastery housed fifteen thousand celibate monks. Drepung is divided into what are known as the seven great colleges — Gomang (sGo-mang), Loseling (Blo-gsal gling), Deyang (bDe-dbyangs), Shagkor (Shag-skor), Gyelwa (rGyal-ba) or Tosamling (Thos-bsam gling), Dulwa (‘Dul-ba), and Ngagpa (sNgags-pa). Today the population at the monastery located in Tibet is much smaller with a few hundred monks, due to population capping enforced by the Chinese government. However the institution has continued its tradition in exile within South India, relocated to land in Karnataka given to the Tibetan community in exile by Prime Minister Nehru. The monastery in India today houses over five thousand celibate monks.